Eric Cantona, legendary soccer player, hosts a series of video clips for Nike & Google’s football initiative, Joga. Cantona, known for his playing for French and English football teams (Manchester), appeals for a renewed sense of beauty in the game, in the lead up to the FIFA World Cup. 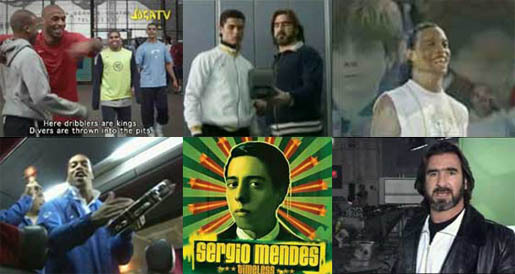 The series of online football videos, hosted at Nike Football, is known as “Joga Bonito”, Portugese for “Play Beautiful”. Google and Nike have worked together to establish an online community, Joga.com, playing on the concepts developed in the videos. The camera moves to the screen on which we see a team praying together, followed by classical skillful playing together. We are given the Joga Bonito logo, and are pointed to nikesoccer.ca, nikesoccer.com, nikefutbol.com, and nikefootball.com. All videos are available to view and download on the Nike Football site, in Windows Media, Quicktime, PSP and iPod formats. Joy uses genuine footage of Ronaldo de Assis Moreira, who is usually known as Ronaldinho Gaucho to distinguish him from fellow Brazilian Ronaldo. Cantona introduces the clip by reminding us of the capacity of a child to try, to dare, to play “just because you like it”. The video features shots of Ronaldinho playing a futsal (indoor soccer) match as a child in Porto Alegre, Brazil, mixed in with footage of him playing now. Ronaldinho, despite his star roles playing for Brazil and FC Barcelona, continues to exude pure joy in the game. Cantona concludes by advising his friends never to grow up. Heart has Wayne Rooney going into goal himself after conceding in a training session. Cantona says that without heart we cannot play. Rooney currently plays for Manchester United and the English national football team as second striker. In this spot he takes over as goal keeper before taking the ball back to score a goal himself, despite his coach’s instructions to stay where he is. Music in Nike Heart is “Caroline” by Radio 4, from “Enemies Like This”, released in May 2006. Skill has a footballing duel of skill played out between Cristiano Ronaldo (Portugese player signed with Manchester United) and Zlatan Ibrahimovic (Swedish player signed with Juventus in Italy). Eric Cantona tells us that football is like fencing. It is a noble art. He shows Cristiano some footage of Zlatan’s skills demonstrated in his changing rooms, then challenges him “can you beat that?” The two players proceed to demonstrate their finesse with the ball in their respective changing rooms and on the field. Music on the duel clip is “Return of the Tres”, by Delinquent Habits. Download the track from iTunes. Cantona says that we only know how to make beautiful music if we know how to play in an orchestra. In the Brazilian bus Ronaldinho, Ronaldo, Adriano, Robinho, Cicinho and Roberto Carlos are singing and playing together on musical instruments. As they move from blue to yellow in the changing rooms, the ball goes flying from foot to foot. Inspired by a communal prayer (first introduced by the Brazil team as they prepared for their 2-0 victory over Germany in Japan in 2002), they head out into the stadium to play in front of the crowds. The Nike Joga Bonito campaign was developed at advertising agency Wieden + Kennedy Amsterdam. Staff included creative directors Mark Hunter, and Alvaro Sotomayor, creatives Johan Dahlqvist, Carlo Cavallone, and Joe Staples, group account director Patricia Cerda, account team James Goode and Feliciano Robayna, producers Sid Daffarn, Elissa Singstock and Veronika Kaufmann, media advisors Paul Mukherjee and Mel Shannahan, adaptation staff Jasmina Peri, Lorenza Montorfano and Claudia Casagrande, executive creative directors Al Moseley and John Norman, executive producer Tom Dunlap and Elissa Singstock. The TV spots were directed by Ulf Johansson with production company Smith & Jones Films, with producer Philippa Smith. Editors were Sam Gunn, Adam Marshall and Russell Icke with Whitehouse Post, London. Post production for Cause was done at Moving Picture Company, London. Post production for Joy, Honour, Skill, Team and Heart was done at The Mill by a team including Fi Kilroe, Darren O’Kelly, scheduler Cath Short, Lead flame Giles Cheetham, CG supervior Hitesh Patel, flame assist David Birkill, Paul Wilmot.